While harvesting blueberries at a friends’ garden I started thinking of the color blue and why it appeals to all of us gardeners. I was taking care of this fabulous garden while the owners were out of town so I had a lot of time to enjoy all of the plants including the blue flowering ones. The color blue, especially in the summer, soothes our senses. Soft blues will calm the mind and aid concentration. Strong blues can stimulate clear thoughts. I’m not sure if the different blueberries fall into this category but I sure enjoyed tasting each of them. Of the 4 different types of blueberries I harvested I think I liked O’Neal, a variety of Southern high bush, the best. The large light blue early South Moon were also delicious as were the Blueray and Bluecrop. 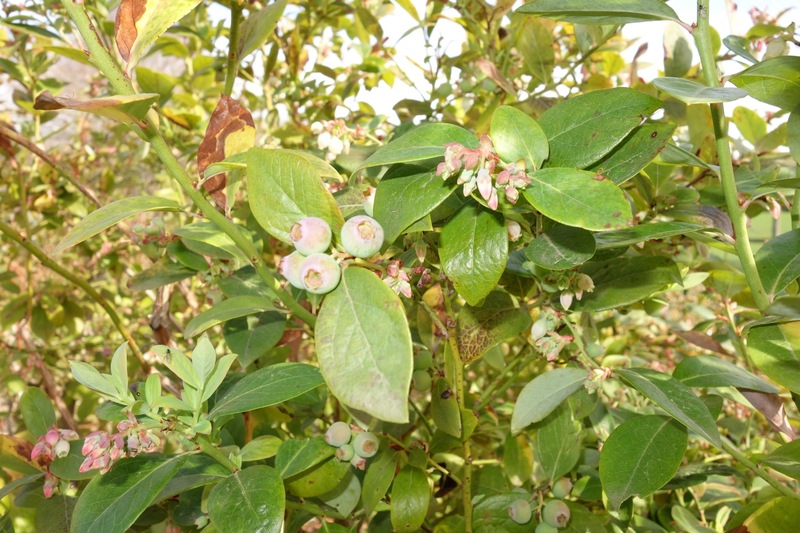 Although many blueberry species are considered self-fertile, all blueberry bushes benefit from cross-pollination and produce larger and more full flavored crops with another bush nearby. To ensure bees carry pollen from one bush to another, space them within 6 feet of each other. When the weather gets hot I head to the part of my garden where the blue hydrangeas are blooming. I have several mophead types that vary in color from sky blue to deep blue. One is almost blue-violet this year although I didn’t add anything to the soil this winter to make it more acidic. I don’t have any lacecap varieties so I took a cutting of a spectacular Mariesii variegated one at the garden I was tending. It’s the white in both the foliage and the flower that makes the rest of the blue blossoms really standout. True blue flowers are rare. We use words like cerulean, azure, cobalt, sapphire, turquoise, electric blue or steel blue when describing blue flowers. Hybridizers have tried for years to produce a true blue rose or blue daylily. Blue plant pigment is hard to manipulate. It occurs in the daylily as a sap-soluble pigment and is difficult to segregate. Lilacs, purples, orchids and mauves we have and working with them hybridizers may eventually get near blue, but pure blue probably never. Rose hybridizers striving for true blue have come close by crossbreeding lavender hybrid teas in order to produce offspring having optimum amount of cyanidin, The results have been more of a silvery lilac or mauve. A blue rose is still in the future although labs in Australia and Japan are genetically modifying the pigments from petunias to produce a blue rose. Their results are not yet perfected and these roses are more of a lilac in color and can not survive conditions outside the lab. It is apparently very difficult to isolate the pigment cyanadin. Delphiniums have a monopoly on it. There are many blue perennials as handsome as they are durable that we can enjoy in our gardens today. Besides the old fashioned hydrangea, there are violas and campanulas. I”m also growing a blue impatien called ‘Blue Diamond’ that attracts the hummingbirds. All are valuable in the shade garden along with omphaloides and brunnera. The blue spikes of a long blooming peach-leaf campanula just go together with the white and green variegated foliage of Jack Frost Siberian bugloss. In early spring we are dazzled by our native ceanothus which bloom with deep blue, sky blue or electric blue flowers. Emerald Blue phlox subulata carpets the ground in spring with clear blue flowers. Penstemon heterophyllus, a California native hybrid, carries dense spikes of bright blue, bell-shaped blossoms. Make sure your garden has a blue section to cool you on a hot day.